Miami Marlins left fielder Christian Yelich (21) celebrates after scoring during the first inning. WASHINGTON (AP) — Mike Redmond’s Miami Marlins did plenty right over the first two innings Wednesday night, building a five-run lead against the Washington Nationals. From there, though, things fell apart. "Every time we got ourselves in a good position," Redmond said, "we made a mistake that cost us." Carlos Marmol allowed Jayson Werth’s go-ahead grand slam in the eighth inning, after Brad Hand gave up Bryce Harper’s upper-deck, three-run homer, and Miami made three errors during a 10-7 loss. "If you give them extra outs," Redmond said, "they’re going to make you pay." His club already has made 11 errors in nine games. 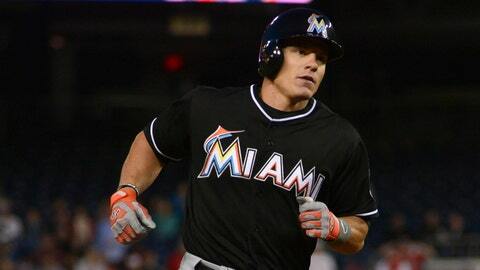 Werth and Harper each delivered his first homer of the season as the Marlins blew advantages of 5-0 and 7-6. Werth’s shot off Marmol (0-1) came with one out, after the reliever allowed a single, hit a batter, then intentionally walked Anthony Rendon to load the bases. Redmond said he walked Rendon in hopes of getting a ground ball from Werth. A double play would have ended the inning. "They scored seven runs on two swings," Redmond noted. "It takes us 14 hits to get seven runs." Werth’s shot made a winner of Tyler Clippard (1-1), who yielded Garrett Jones’ tiebreaking RBI double in the top of the eighth after walking a pair of batters. Rafael Soriano worked the ninth for his second save. Jones’ hit put Miami ahead 7-6, but Giancarlo Stanton was thrown out at the plate on Rendon’s relay of Werth’s throw from right on the play. Werth then came through with his fourth career grand slam, and first with the Nationals. He drove an 0-1 pitch into the visitor’s bullpen in left-center, then acknowledged the fans’ cheering with a curtain call. "Crazy game. Back and forth," said Werth, who violently tossed his bat after making contact. "One of those games where you play that long, you want to win." Werth came into the game having driven in one run all season, but was responsible for five Wednesday, including an RBI groundout in the fifth after Rendon’s triple. That made it 5-4. Harper began the night hitting .160 with zero RBIs and nearly three times as many strikeouts (11) as hits (four) this season. Dropped to seventh in the batting order, the 2012 NL Rookie of the Year culminated a 10-pitch at-bat against left-hander Brad Hand in the fourth inning by turning on a 94 mph offering and hitting it over the foul pole and into the fifth row of the third deck beyond right field. "Trying to throw a fastball down and away," Hand said. "It kind of went down and in, right into his happy zone." That trimmed the Marlins’ lead to 5-3, and helped Washington overcome the shortest start of Jordan Zimmermann’s career. The righty, who won 19 games last season, left after allowing five runs in 1 2-3 innings. Derek Dietrich was awarded a two-run homer after a replay review in the second inning, and Christian Yelich wound up with three hits and two walks for Miami. "From the fourth inning on, it was really a struggle to hold these guys down," Redmond said. "We used a lot of pitchers, but we couldn’t find a way to get those big outs." NOTES: Zimmermann’s previous shortest outing was two innings on July 21, 2013, against the Dodgers. … Marlins RHP Arquimedes Caminero threw 1 2-3 hitless innings in his season debut. He was recalled from Triple-A New Orleans before the game to replace RHP Jacob Turner, who went on the 15-day DL with a strained right shoulder. Turner was supposed to start Wednesday but was hurt during batting practice a day earlier. Instead, Hand got the start and went 3 1-3 innings, allowing three runs.